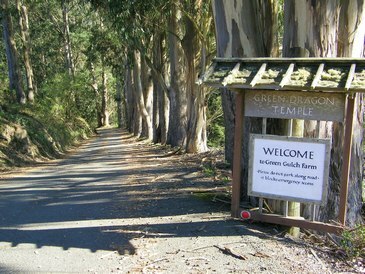 I am writing you from the Green Gulch organic farm/Green Dragon Zen Temple, a Buddhist practice center half an hour North of San Francisco, in Marin County. 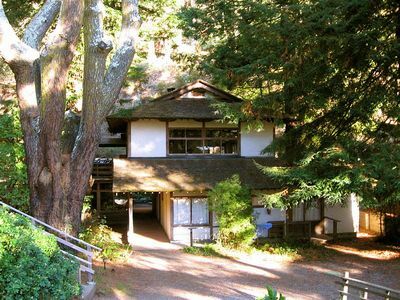 It is one of the three campuses of the San Francisco Zen Center, along with City Center in San Francisco city and Tassajara in the Ventana Wilderness of Monterrey County. 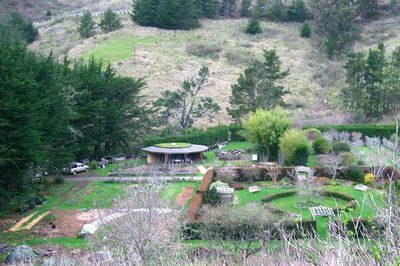 Green Gulch itself consists of a bunch of sturdy, Japanese-decorated buildings set at the end of a a strikingly beautiful wet, rainy valley full of farm fields, near Mill Valley and Muir Beach in Marin County. I am here with around thirty other students of various ages and levels of experienced, a few more men than women and all but three non-Hispanic white. 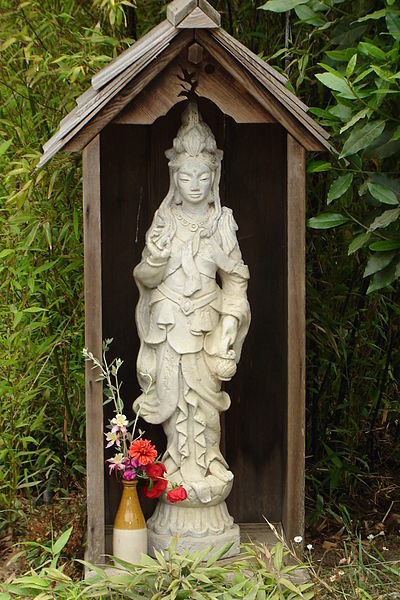 We’re here for a seven week “practice period”, full of Buddhist meditation, study, and work. It’s been going well so far. 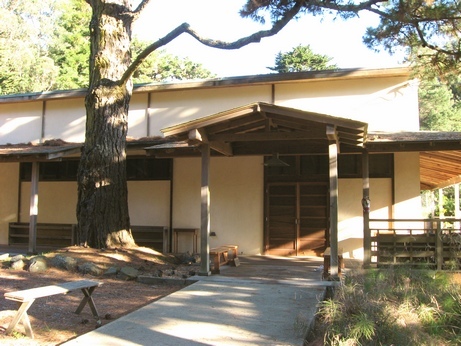 Our daily schedule is as follows: I sleep in a small room with two other men in a dormitory style building (named “Cloud Hall”), which is in the same building as the large Japanese-style Zendo (meditation hall). 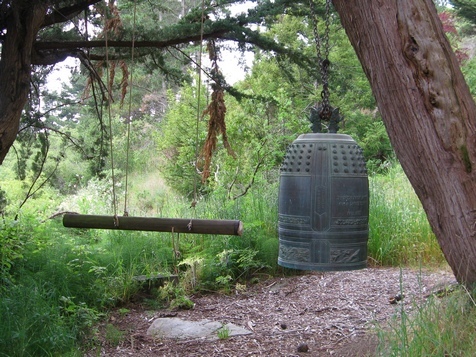 We wake up at 4:30 AM six days a week to the sound of a traditional Zen wake-up bell being rung as it goes up and down the hallways. This was at first difficult and irritating, I was grumpy most mornings and hated Zen Buddhism, but now I am used to it and even like the integrity of waking up early and at the same time daily. We have until 4:50 to get into the Zendo and sit on our cushions, and I use that time to dress, use the bathroom, and do yoga. In the last week, to avoid struggling with sleep all meditation time, I have also been drinking contraband Diet Coke before leaving my room. At five am, we begin forty minutes of sitting meditation (called “Zazen“), accompanied by ritual bells and drums hit at certain times. My zazen has been going better all the time. We have been instructed not to think about trying to get anywhere or achieve anything during meditation, but there you have it. At first, when I first got here, my mind wandered endlessly, often to World War Two naval history (my passion when I was about ten) and to what songs to put on music mix tapes that I could make for friends. My breathing was rapid, and I had anxiety-based nervous tics that I was sure were driving the people meditating on either side of me crazy (even though they swore, when I asked them, that they didn’t notice anything at all). Over time, I could also feel myself settling into my experience, I could feel myself making headway against spacey-ness and ways my mind might be avoiding the present moment. Meditation seems easier now, four weeks later, I think that maybe perhaps I’ve reached some of the bliss states of a concentrated mind that ancient writers described, I think. 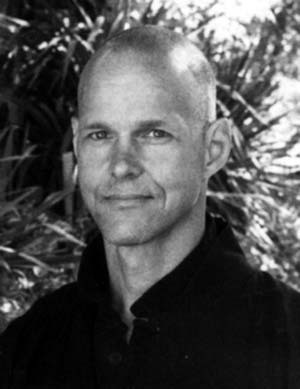 Reb Anderson is our head teacher for this seven week intensive. He is the former abbot of the SFZC, and, to my experience, a confrontingly spiritual and profound man. I have felt encouraged by his teachings while here: he has asked us to just be ourselves, with nothing added or subtracted, and to not try to be or do anything special when on the cushion. I am doing my best to just observe, without meddling in any way. I’ve also been sitting in more traditional Zen-like sitting postures, like the half lotus posture, instead of kneeling, even though it hurts more. After the first period of sitting comes twenty minutes of snail-paced meditative walking (“kinhin”), followed by forty more minutes of zazen. When we are done with that, we have morning service, the first of four daily services, which each consist of five to twenty minutes of chanting scripture in both English and Japanese and ritual bowing. It’s all quite religious-y, which at first seemed offensive to me and contrary to the radical non-word-iness that I thought Zen Buddhism is all about. I’ve grown however to find some meaning and even pleasure in the ceremonies. At seven am, we circle up and are assigned temple cleaning jobs (called “soji” in Japanese). My soji assignment the first week consisted of cleaning a bathroom, the second week was setting out dishes for breakfast, the third was doing the last night’s dishes before breakfast dishes began flowing in, and now it is Zendo sweeping and cleaning. Between 7:20 and eight is a formal silent breakfast in the dining hall, complete with ritual bowing, chanting, and a bunch of rules (for example, no spoon-on-bowl noises allowed). We usually have a ten to twenty minute break after that, before a community-wide work meeting (which is attended by all people on the grounds – people in my seven-week practice period program, the long-term paid staff, and the clergy), where work assignments are made. Announcements are also made during this meeting, and it often takes longer that it might otherwise because of things like people looking for lost socks and requests to not make fun of people who eat a lot. From 8:40 to 11:45 (like all of these times, it’s the same daily), we work, with a short tea break in the middle. 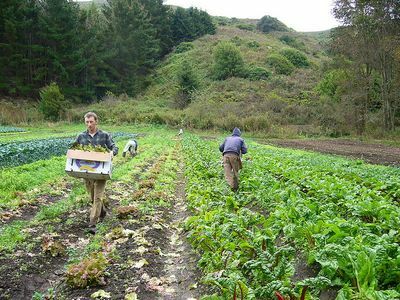 I have mostly been working on the farm, which has involved clearing brush, creating seed trays, shoveling horse manure onto compost piles, harvesting kale, and digging ditches. I just today however got a new assignment, “General Labor”, which seems to connote giving birth but otherwise fails to explain itself. The other departments are maintenance, garden, and guest program (i.e. cleaning the nice hotel-like building where outsiders who come to G.G. stay). It often rains hard before and during my work period, and it is often cold and sometimes hot. There are times when I think to myself, “I’m sorry, but I cannot currently be described with any other adjective than miserable.” All in all, however, I usually enjoy the work. I like getting out of my comfort zone, expanding myself in that way, I like the camaraderie, and I like working hard and productively and physically. I also have been enjoying applying Zen teachings (as I understand them) to the work, which means thinking about only work while working, and then being done when I am done. At quarter of noon comes more chanting at another service, and then we have forty-five minutes for lunch (which usually means soup, salad, and the awesome, freshly baked Green Gulch bread, a gourmet luxury send out to restaurants all over San Francisco). We’re allowed to chat during lunch and there is minimal chanting, unlike breakfast. Then comes another work meeting (which usually has fewer announcements), and forty-five minutes more of labor. 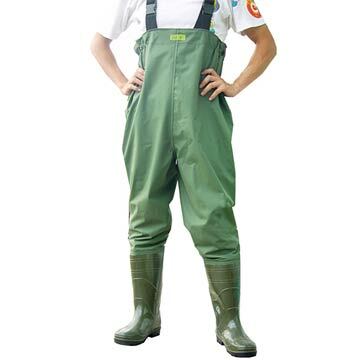 When the two-hour break period starts at two pm, it takes me a while to walk back from the farm, get out of my rain gear and/or work clothes (I have been wearing some fisherman’s chest-waders, olive green and coming up to my armpits, that are very effective in rain but are somehow failing as babe magnets), and shower. Sometimes during the break I exercise, sometimes I nap, I often take care of the little things I need to. When four pm comes, I often wonder where the time went so quickly, however. At four, we have an hour of study hall, where we have been asked to only read Buddhist texts, although some people seem to be reading novels there and I wrote the rough draft of this letter. 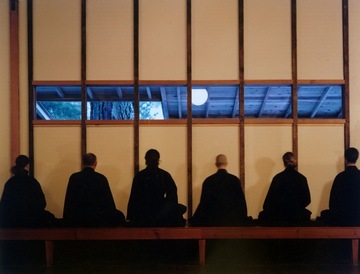 At five, we go to the Zendo to meditate again for forty minutes, followed by another service, followed by ninety-minutes for dinner in the dining hall. Dinner is often pasta, rice, or soup, and salad or steamed vegetable – it’s superhealthy but almost always weirdly spiced, California health-food style, so it’s taken me some getting used to. After dinner, there is break time, which usually affords me some time to socialize or otherwise relax. At 7:30 pm, three nights a week we meditate, one night a week we get in small groups and discuss Buddhist theory and experience (and I get to blind everyone with the brilliance of my philosophical insight! ), and two nights a week we have class. One class examines Zen Koans, the confronting and non-logical instructional stories, the most famous of which have been abridged as, “What is the sound of one hand clapping?”, “Does a dog have Buddha nature?”, “What was the face that you had before your mother and father were born?”, and “If a tree fell in a forest and there was no one there to hear it …”. The other class examines an ancient Indian text, Nargajuna’s Mulamadyamkakarika, which examines the Buddhist teaching of dependent co-arising, or how the entire universe is interconnected and nothing exists or “happens” except as an action of the entire show. I find both classes to be powerful, mind-altering experiences, except when I fall asleep. Reb, the teacher who I mentioned before, teaches both classes. I usually get into bed and turn out my light within ten minutes of class or meditation ending, given that I will rise seven-and-a-half hours later. I almost always, however, lie there for a while, awake and wound-up, before dropping off. Sleep has been important to me while I have been here, and almost nothing interests me at the end of the day except getting to sleep as soon as I can. I also have been taking great pleasure in finding ten minutes or half an hour where I can to nap. I have had a conflict with one of my roommates, who I was friendly with before this happened, because, often, while I have been asleep, he would enter and pop on the overhead lights, slam the door loud when he left the room, and stomp around as he passed by my mattress on the way to his. All this ruckus was serving to constantly wake me up from my sleeping. I was enraged, especially after the fifteenth time and after I brought it up with him and he yelled a little and said that we had nothing to discuss. I finally talked to the coordinator of guest students, who has become something of a friend and who was going to have a conference with the two of us. I also wrote my roommate a note, and he wrote me a generous and understanding one back, so it looks like the conference is not needed, case closed. The daily schedule varies on three days : Sunday morning, instead of work, I have a basics of Buddhism class (the teacher seems to appreciate my input on the things that I have learned something about) followed by public meditation and a lecture (given by a different person each week, often Reb) that are attended by hundreds of people from around the Bay Area. It’s weird to see the meditation hall filled that many chairs and people, all streaming in with facial expressions of spiritual seeking and spiritual hunger, when it is so empty during the week. After lecture, I serve the visitors tea. It’s usually festive and fun all morning. Thursdays and Fridays are also different. We meditate all day until noon on Thursdays, there is no morning work period. This sitting has been a powerful deepening for me, I feel centered and aware afterwards. One annoying feature, however, is “oryoki” (I call it karaoke)-style eating. This is a complicated ritual way of serving, being served, folding and unfolding an eating kit, and eating, all in the Zendo, as we sit on our cushions. It makes the regular formal silent breakfasts look like the crowd at a ZZ Top concert getting rowdy, Rowdy, ROWDY in comparison. I can see the point of such formality, I guess, however, it is serving to make me more aware and careful. After the sitting, we have a long “nenju” (holiday-break) ceremony and are then we are off until Friday after dinner. I have used the time to do laundry, exercise (running, pushups, the rowing machine in the basement, yoga, a long hike with other students), take care of business, sleep late, eat the more normal-world food they serve during our days off, and hang out when my girlfriend come to visit. The first week, I left the valley during the two-day weekend break to get stuff from my storage space and from stores; I hadn’t realized that we would be asked not to leave during the entire seven weeks, and I wanted to stock up on all that I would need. I had to move Heaven and Earth to get permission, however. 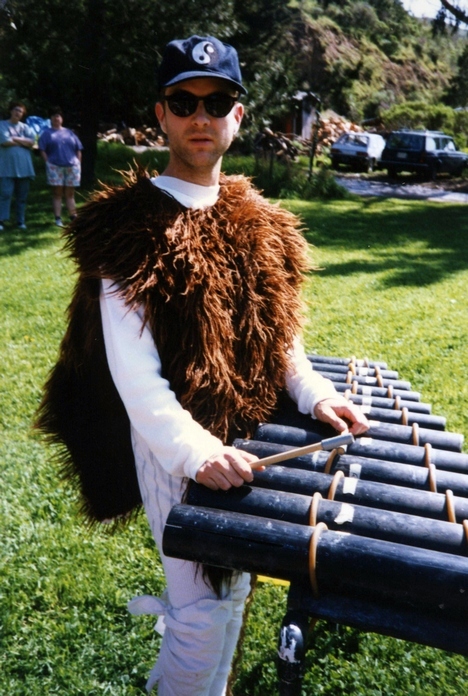 At first, the Director of Practice (“Tanto”) said that if I left that I should not return. Lots of people leave here during the day to go to do jobs, so I had no idea of the hassle involved, expecting that my departure would be similarly breezy. Apparently, me and my desire to work at the discipline demanded by the schedule are unknown qualities to the staff here, so they took my desire to leave as a sign that I was not serious about being here. I explained that I wanted to do the program, that I was excited about it and intended to follow all guidelines and attend all scheduled events, and that I had no intention of leaving a second time, but could I please leave once to get my affairs in order. They seemed well pleased with this line of conversations and sent on my way South with official Zen blessings. Out schedule was also altered for two days during out first week for full-day zazen sittings. One was “tangario”, or a sitting done all day without breaks and seen as representing a sincere request to be part of temple life, and the other was a regularly scheduled monthly one-day sit. We will also sit all day for five days straight (a “sesshin“) starting the night of Sunday, March 24th (it will end right before my birthday!). The stomach-grumbling factor is high on such all-day-meditation days because all meals are eaten in the unfortunate oryoke style. Food takes on added significance here because it is sometimes the only diversion. There is no music here, I miss it. This place is different from the Esalen Institute, where I was last Fall, in that expressive fun and emotional expressiveness are discouraged and spiritual rigor is required, rather than vice versa. All of us know that everyone else here is pushing themselves superhard, there is a sense of camaraderie, but the whole fun aspect is sometimes a little underdeveloped. Some number of tenants here fall into the grumpy end of the affective spectrum, I’ve observed. And, many people here are also groovy, in all the ways that people are groovy. There is a guy here, Paul, who I think might be one of the funniest people I’ve ever met. He is so lively and outgoing (he is a professional musician/comedian), he seems out of place with all the introspective and socially awkward monks here – I guess Paul read a book about Zen, and decided that he wanted to check out what it’s all about for himself. Anyway, when he and I have been assigned to wash dishes together, he has been singing, “Do the Dishes” (to the tune of “Do the Hustle”) and “Silverwear” (to the tune of the Christmas song “Silver Bells”) – that is, until the priests shush him up. One night, before our class studying the Mulamadyamka, he asked me if I was “ready for the Mula-yo-mama-ka”. The bottom line of this report from the frontier is that I am finding this experience valuable in both obvious and hidden, subtle ways.